Urdu literature harbours a rich tradition of poetry that takes a variety of forms including the ghazal, masnavi, nazm, qat’at and ruba’i. Urdu poetry is famed for its intensity of expression and, as such, has become an oft-used medium across the subcontinent for the expression of universal emotions. Borrowing elements from both Arabic and Persian poetic forms, Urdu poetry is considered the fruit of Indo-Iranian/Indo-Islamic culture and has over time developed its own distinctive quality. The Urdu ghazal, in particular, is widely-considered the pride of Urdu poetry – it being the most well-developed form of Urdu poetry - and has enjoyed much popular appeal. Urdu poetry continues to be an important part of the Pakistani cultural landscape to this day and thrives through mushaireh (popular poetry recitals). Mushaireh are excellent platforms for Urdu poets to develop and cultivate their art forms as well a wonderful opportunity for listeners to immerse themselves in the rhythmical and stirring performance of Urdu poetry. The short course aims to introduce students to a selection of works composed by distinguished classical and contemporary Urdu poets. 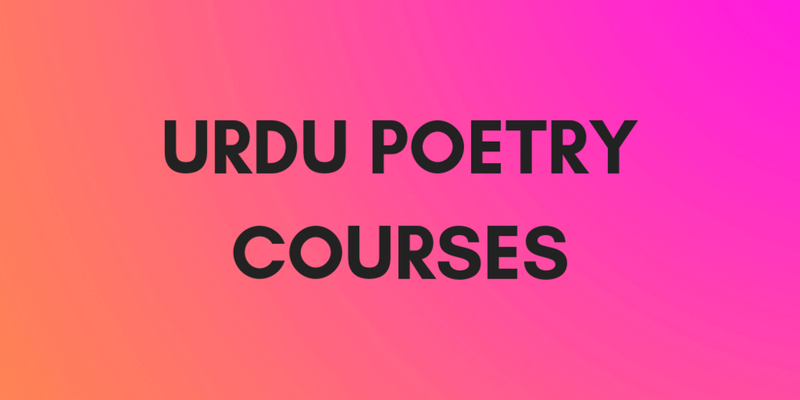 The course will involve the close reading and interpretation of poetry texts from the likes of Iqbal, Ghalib, Faiz Ahmed Faiz, Kishwer Naheed Bahadur Shah Zafar, Sahir Ludhianvi, Parveen Shakir, Habib Jalib, Fehmida Riaz, Hafeez Jallandhary, Ahmed Nadeem Qasmi, Akhtar Shirani, Sufi Tabassum, Muneer Niazi, Nasir Kazmi and Noshi Gilani.